The Pacific Northwest is amazingly beautiful and there is nowhere better to enjoy its beauty than the Oregon coast. Sandy beaches, lush forests, and breezy temperatures make Oregon an ideal Summer destination. An easy drive down Highway 101 offers travelers access to all the coastal sights. It’d be difficult to squeeze it all in within one day so stretch out the drive and stay overnight along the Oregon Coast! If you want to stay somewhere unique, look no further than the Heceta Lighthouse Bed & Breakfast near Florence, Oregon. My husband and I flew into Portland in April 2018 and drove to our first Coastal Destination: Cannon Beach. We explored the area, stayed the night, then started our road trip the next morning. You can read about all of our stops here. When looking for a place to stay, we wanted to stay on the beach and close to our final destination, Florence. My husband found the Bed and Breakfast. We have never stayed in a B&B before, so we figured this would be a great opportunity to see whether or not we liked it. I cannot recommend staying here enough! Find out more about this unique, beautiful bed and breakfast below! This beautiful home, renovated to resemble how the building would have looked under the care of the assistance lighthouse keeper’s family, can sleep up to 15 guests. Guests can choose between 5 bedrooms. Some rooms have ocean views and a bathroom, while others overlook the garden and share a community bath. We stayed in the Mariner’s II room, which has its own bathroom and views of the beach below. There is a small heater in the room, but in mid-April we only needed it in the morning hours. The bed was very comfortable, with the best pillows we’ve experienced when traveling (usually pillows are too soft and you need three). The home features two cozy parlors overlooking the beach and are great spaces to interact with the other B&B guests. When we arrived, we shared our wine from Flying Dutchman Winery with a few of the other guests. The two couples were from Oregon and one couple eloped at the Bed & Breakfast earlier that day! In the other parlor are games, a comfy couch, and a fireplace. The historic charm invites quests to put down their phones and trade technology for board games and books. In one of the parlors, guests can find photos from the past depicting the building of the lighthouse and life in the early days of the lighthouse’s operation. Other features of the home include a picturesque porch facing the ocean, a kitchen for guests to use, and a large dinning room where guests meet for a 7 course breakfast! Don’t plan on leaving early in the morning because the breakfast begins around 8 AM and can last until 11 AM. But it’s worth the stay. Every morning offers something different for guests to eat and many of the dishes are traditional meals. 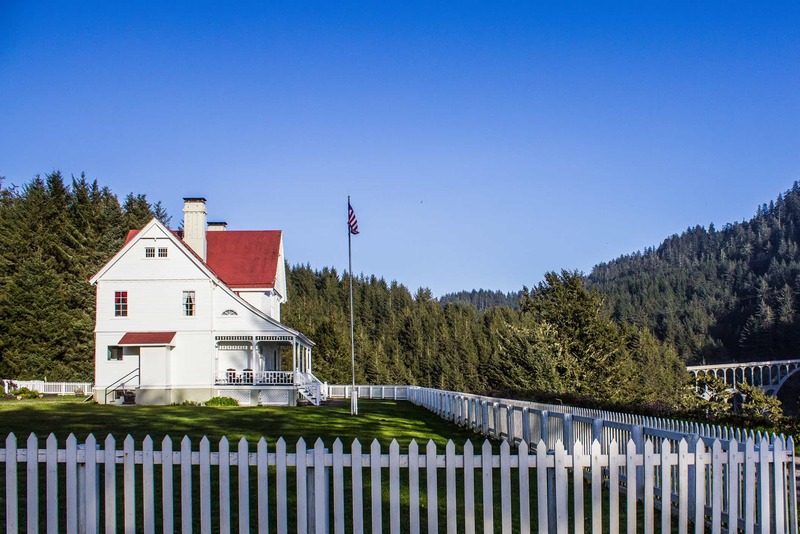 A brief history: Built in the 1890’s, the Heceta Head Lighthouse and the Keeper’s house are both listed on the National Register of Historic Places. When the lighthouse was first built, there was a need for a Head Lighthouse Keeper and an Assistant. Each had a home for their families. Today, only the assistant lighthouse keeper’s home remains, but remodeled to reflect how the Head Keeper’s home once looked. The last resident keeper was Oswald Allik, in 1963, when the lighthouse became automated. Inside the home, guests will find photos of how the lighthouse was built. At the time, the area was isolated with few roads. Supplies were shipped to the beach and carried by horses up the hillside to the lighthouse’s current location. No easy feat! Isolation also meant the lighthouse keepers’ families had to provide for themselves. Keeper Olaf Hansen stayed on longer than most in those early days and is responsible for constructing a garden, school, and post office. As electricity was introduced to the area in the 1930’s, only one keeper was required. One of the homes was demolished. The space was later used by the Coast Guard during WWII and the remaining home bunked the men on patrol. When the lighthouse became fully automated, the home was turned over to Lane Community College to be used as a satellite campus. Once listed on the national register, however, a new use for the historic home was needed. A bed and breakfast was the solution to keeping the historic charm and providing access to the public. For more information on the registry, click here for images, and here for documents. Guests can learn more about the Lighthouse Keeper’s House by staying after breakfast for a history lesson given by one of the staff members, or by taking a tour of the lighthouse. Believed to be one of the most photographed lighthouses on the Oregon coast, the Heceta Head Lighthouse is worth a stop, even if you cannot stay at the bed & breakfast. Parking is available at the beach below and guests can purchase a $5 day permit from a kiosk in the parking lot. There is a short trail up the hill, past the Bed & Breakfast, to the lighthouse. Tours are offered Friday through Monday, from 11:00 am to 3 pm (winter 11 am – 2 pm). The automated beacon on top of the 56-foot tower can be seen 21 miles from land, and is rated as the strongest light on the Oregon coast. If you visit during May, be on the lookout for migrating gray wales off the coast! Guests of the Bed and Breakfast are encouraged to visit the Lighthouse at night. The B&B supplies guests with flashlights for the short hike. It was an amazing experience to be there alone with the stars and waves crashing against the rocks below as we watched the multiple beams stretch across the night sky. Where’s the most unique place you’ve stayed while traveling? Share in the comments! The Oregon Coast looks fabulous. I’vve never been to Oregon and it is the place I’m most excited to visit in all of the US. Happy to have your tips for when I finally make it! That’s great! Be sure to check out my other posts on Oregon when you start planning your trip! You can’t go wrong with the Pacific Northwest coastline. This B&B was such a nice, relaxing place to enjoy it. Really wish we had stayed longer. Hope you can visit soon!